Pfizer and Protalix BioTherapeutics announced that the Food and Drug Administration (FDA) has approved Elelyso (taliglucerase alfa) for injection for pediatric patients. Elelyso, a lysosomal glucocerebroside-specific enzyme, is now indicated for long-term enzyme replacement therapy (ERT) for adult and pediatric patients with a confirmed diagnosis of Type 1 Gaucher disease. The safety and efficacy of Elelyso were assessed in 14 pediatric patients with Type 1 Gaucher disease in 2 clinical trials. The first trial consisted of 9 patients in a 12-month, multi-center, double-blind, randomized study in treatment-naïve patients aged 2–13 years. At the end of the study, Elelyso demonstrated a decrease in spleen and liver volume and an increase in platelet count. The second trial was a 9-month, multi-center, open-label, single-arm study that consisted of 5 pediatric patients aged 6–16 years who were switched from imiglucerase (Cerezyme; Genzyme) to Elelyso. 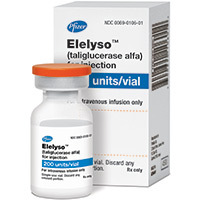 Elelyso was administered for 9 months at the same dose as the patient’s previous imiglucerase dose. Results showed mean spleen and liver volume, platelet count, and hemoglobin value remained stable through the 9 months of Elelyso treatment. Elelyso for injection is available as a lyophilized powder containing 200 units per vial. For more information call (855) 353-5976 or visit Elelyso.com.